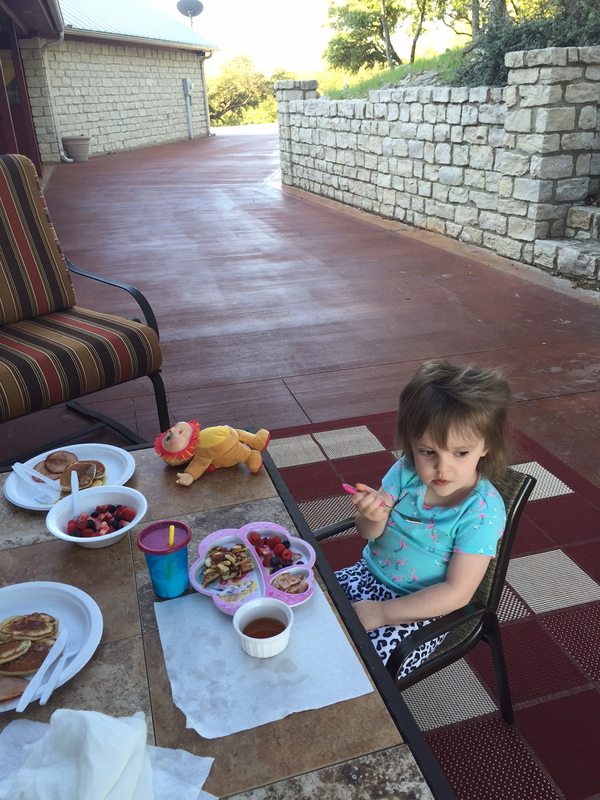 Camp Grammy and Pa-Pa’s pressing agenda included lots o’ fresh air and sunshine! The Outdoors called our names—for 48 magical hours (minus nap/night time). We spent quite a chunk o' time on the front and back porches. Friday afternoon, we explored our place on the Ranger and hung out at the Big Tank. The catfish were dancing with happiness at being fed. They made us giggle and startled us when they jumped! We looked for armadillos and counted Cardinals, buzzards and butterflies. We took a Field Trip to some dear friends' home Saturday morning. They have a beaucoup of animals—domestic and farm. After a good, long nap that afternoon, we played “Bubbles!” on the back porch. Our two little battery-operated bubble makers were in great working condition and the breeze was positively perfect for optimum bubble success. LL helped Grammy water her flower pots. And, yes, we watered some sidewalks, too. We watched “Enchanted” twice—from beginning to end. Both times. We watched Little Mermaid (Only once. Thank you, Lord. It doesn't matter how many hundreds of times Grammy has seen a Disney movie. She cries. Every single last time. Sheesh.). We watched several “Peppa Pigs” and a couple of Sesame Streets. We read twenty books and “worked” three different times in Grammy’s office. LL was happy to head home after lunch Sunday. (Me thinks she was pooped from the busy Camp schedule.) She couldn’t wait to see her Mama and Daddy. She slept, in her carseat in Pa-Pa’s truck, almost the entire way back (two hours-ish)—which is somewhat of a miracle lately. We always cherish small blessings. Wasps and Tigers and Bees...Oh My!